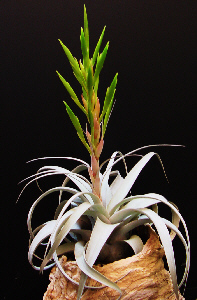 This slow growing Tillandsia is one of the most striking species with large, silver, strap-like leaves making a rosette over a foot across. When in bloom it produces a tall pink/orange spike with chartreuse green bracts and purple flowers. This species likes very bright light and infrequent misting. Spectacular plants available, most at least 6" across!